Despite being something most car owners don’t really fancy doing, engine cleaning is without a doubt one of the most important routine maintenance practices you can conduct for your car. The engine, just like any other mechanical part, requires occasional attention to remove dust, rust, or dirt that might have accumulated on it. Clogged engines wear out much faster than they should and their performance ultimately suffer. Fortunately, having the best engine degreaser can help save you from both the trouble of frequent, needless replacements and heavy expenditure including the possibility of overhauling the engine. For this article, therefore, we walk you through the top five best engine degreaser options available on the market today as well as a comprehensive buyer guide that you’ll find at the end of this post. Now, you might want to ask, how did you guys settle on these five degreasers? Well, our selection was governed by five core factors; safety to the surface of the engine, environmental friendliness, versatility, strength (concentration), prices, and finally, customer reviews. If you’re low on budget but still want your hands on a potent engine degreaser, then Purple Power has to be the best engine degreaser to purchase. Its efficiency surpasses that of other products within its price range. What impressed us the most about it was the dilution capacity. It is highly concentrated which means you can multiply it to cover more surface than the undiluted units would. What’s more? Purple Power is biodegradable. In a world where environmental conservation is a huge topic, a product mindful of this aspect is a sure must-have. If by mistake you spill this degreaser on the floor, chances are low that it will corrode the surface or harm the environment. Purple Power degreaser is also highly versatile. This means that its use is not limited to engine degreasing alone. As such, you can use it on other industrial jobs such as cleaning oil stains on the floor as well washing exhaust pipes and car rims. However, be sure to avoid painted surfaces when using it since it might cause discoloration. Another key feature of this top engine degreaser is that it’s non-flammable. It doesn’t support combustion and thus safe to use in environments where gasoline and other flammable objects are present. You’ll also appreciate its cleaning speed. In our tests, we sprinkled it on a rusty engine and in minutes, we could see dirt washing away. It requires minimal effort with only light scrubbing for stubborn surfaces necessary. While Simple Green is slightly more expensive than many other degreasers on the market, it works powerfully leaving behind no dirt or smell. As such, if you’re sensitive to smelly products or are asthmatic, then this will be an appropriate engine degreaser for you. Simple Green is also environment-friendly. It only cleans what it should and leaves the environment as harmless as it found it. Besides, it’s safe to the hands although you’ll want to avoid contact with your eyes. It’s a multi-purpose formulation. The non-corrosive policy with which it comes makes it a safe option to clean not only the engine but also other parts covered in asphaltic layers, grease stains, or soot. You can use it to clean your bike, your vehicle’s underside, garage door joints, and even household utensils such as your coffee carafe among others. It is highly concentrated. A little amount can clean a significantly large area making it an efficient choice for people on a budget. Use water or any water-based washing detergent to dilute it. However, like anything else, it’s important to refer to its user manual for more information and direction regarding usage. This engine degreaser has no added color and will therefore not stain surfaces where you apply it on. Remember to always rinse the surfaces you clean for a dry shine. POR-15 is a highly concentrated chemical that will degrease your car’s engine surface in just a few seconds of application. You can also use it clean dried up wax, oil stains, mildew, and even algae on wood. However, be sure to wear chemical-resistant gloves during dilution or when sprinkling it on your engine as it can be a bit itchy on the skin. For surfaces with sticky stains, it’s recommended that you first saturate them with a concentrated solution of this degreaser before adding some water to rinse off the grunge. POR-15 is eco-friendly and thus doesn’t poison the soil when it accidentally spills on it. However, manufacturers recommend that while using this degreaser, you can spread a mat underneath the working area. Carefully discard waste where it’s unlikely to corrode other objects such as the dustbin once done using it. For starters, this is one of the most popular engine degreasers today that boasts over 35 years of degreasing service. Its potent formulation requires just a few droplets on greasy surfaces to work its magic. Unless your engine’s surface is too mucky, the dirt will wash off on its own thereby saving you the trouble of scrubbing. You can even use it to clean internal components of your engine since it rarely eats away steel unless it’s stained with rust. For brighter finishes, consider rinsing the surface with a jet of running water. 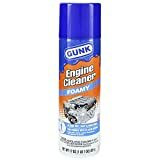 In our examination, we also discovered that this degreaser by Gunk not only works on industrial components but also on household items covered in soot, rust, and waxy stains. This versatility makes it suitable for any metallic object whether with color or without. A caveat though is that Gunk Engine Degreaser is a non-biodegradable product and this means you should rid it off with lots of caution. Krud Kutter Degreaser is yet another powerful formulation that is pleasant to the pocket but harsh on stains. It comes packaged in different sizes thereby allowing you the consumer to choose and pick a bottle that best suits your needs. Due to its highly concentrated nature, you may want to dilute it especially if you clean your engine on a regular basis. Avoid contact with colorful components since it reacts with paints. This product is biodegradable and thus completely safe for the environment. It contains surfactants, emulsifiers, and detergents all blended in a water-based solution. Its slight scent is only felt by highly sensitive individuals. Krud is free from petroleum, ammonia, and bleach and is thus non-corrosive. 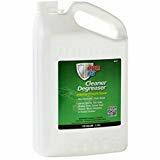 This formula is highly versatile and so feel free to use it when cleaning your vehicle’s carpet, concrete, leather, and even plastic surfaces. The only shortcoming with this engine degreaser is that it takes quite a while to dissolve stains from the engine especially tough. All the same, the end results are flawless. Best engine degreasers will not just wipe off your engine’s surface. If anything, it will give it a sparkle especially if contains petroleum as a makeup element. However, there are numerous other factors to consider when shopping for one. For example, it’s always advisable to first assess the fragility of the part of the engine you seek to clean. Why? The building agents of most grease cleaners are pure chemicals and can easily corrode paints, rubber, and other sealing surfaces. Looking for an effective engine degreaser? Here are the different types you’ll find on the market today. This type of degreaser contains a solvent capable of washing off the grease and dissolving the residues resulting from the chemical reaction of the process. It contains ethanol as its main building block. The flip side though is that it can decolorize surfaces over time. These are excellent cleaners of moving parts of the engine such as the bearings, rotator belts, and crankshaft joints. They work by dissolving dirt. Other than cleaning engines, you can apply these on electrical contraptions due to their poor electron conduction nature. They do not require rinsing with water after use. A search for the best car engine degreaser can be overwhelming and time-consuming. However, several pointers can ease your odyssey and solve your problem much quicker. Engine parts are expensive and thus what you apply on them ought to be innocuous. The chief role of a degreaser is to eliminate grunge and any unwanted substances- it should achieve this without reacting with your engine’s coating or your hands. Luckily for you, the cleaners we reviewed earlier on for you are not only harmless to steel but also on rubber and paints. The only exceptions are the degreasers which we instructed you to dilute first before using them. Best degreasers will not just wipe off grease but also inhibit its formation in future. Engines coated with iron or its alloys are likely to fall prey to rust and accumulation of dust over time. Degreasing them with multi-purpose cleaners will often be an adequate measure. Find a top engine degreaser that will sufficiently serve both the engine and other moving parts that require regular cleaning. Solvent-based cleaners are notorious for releasing irritating scents. If you have respiratory shortcomings, you should instead opt for water-based degreasers. Highly concentrated chemicals escape into the air when exposed. It is, therefore, prudent to purchase degreasers that are vapor-proof to increase their durability and effectiveness. However, should you buy products of this nature, ensure you dilute them before use. Never attempt to degrease a hot engine. This way, you run the risk of damaging its surface by corroding it. Keep it cool or warm if you must. Cover electrical parts- They are often highly sensitive to degreasing formulas especially the petroleum-based ones. Ensure you have pressurized running water to rinse your engine once you are done with the cleaning. Ensure you have pressurized running water to rinse your engine once you are done with the cleaning. Dispose of all materials responsibly. Having these degreasing tips in mind, we can now proceed the next stage. For demonstration purposes, we’ll use Gunk engine degreaser which is one of our favorite cleaners by the way. Dirt absorber preferably from a woolen material. First, cover all the engine parts that you do not target for your cleaning which helps shield them from coming into contact with contents of the degreaser. Usually, these are electronic components such as the alternator, the fuse box, the distributor, and the air filters. Water-resistant materials such as plastic bags will suffice. Also, cover up the surface where dirt and other drippings will fall. We recommend an absorbent material since it guards against spilling over of the soiled content. This step is optional. You can use petroleum-based products, warm water, or natural degreasers for this. The aim is to lessen chemical concentration and prevent discoloration of your engine. Dilute Gunk degreaser only when fragile parts are involved. The objective here is to soak the engine surface. Sprinkle Gunk degreaser repeatedly until particles begin falling off by themselves. Use a brush with firm bristles to wipe off regions that are heavily soiled or aren’t well saturated. For a shinier output, ensure your degreaser doesn’t dry off. You can direct a stream of water over the surface while at it. What Are the Benefits of Cleaning Your Engine? Let’s face it, no one wants to one day wake up to the horror of a damaged engine. Leaks are the primary contributors to such situations since they allow coolant liquids to spill leading to overheating problems. A great engine degreaser, however, will help increase your visibility towards these faulty spots. A clean engine translates into an attractive, high performing beast. Dirt and dust block your auto’s beauty and lowers its value. In fact, many motor purchasers and vendors tend to be overly concerned about the appearance of the engine. Luckily, a good degreaser can help you maintain your engine’s aesthetic value quite effortlessly. The cleaner your engine becomes, the longer the mileage it covers. Grunge increases the possibility of peeling off of the engine’s surface. The more it accumulates, the weaker the surface becomes. Degreasing prolongs its life and saves you big on stresses and unwanted expenses. Remove the protective gears you had put on earlier. Dump the absorbent material away from the working area. If it’s reusable, soak it in water and apply cleaning detergents. Hold on for about thirty minutes before running your engine. Go ahead and throw in some feedback to communicate any concern or share with us your experience. All the same, revive your motor’s glory and gusto with the best engine degreaser today.